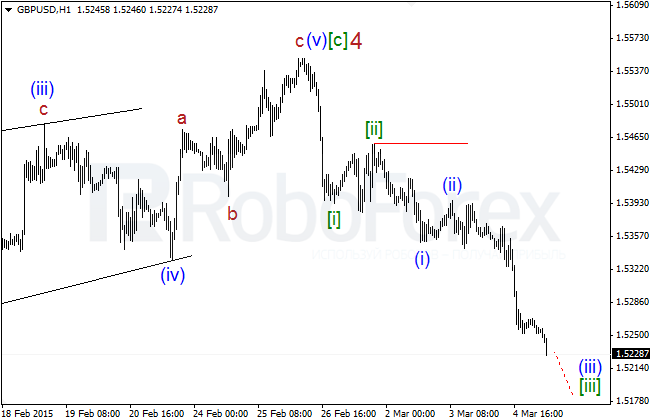 Euro continues moving according to the forecast and forming a large descending impulse inside wave (v) of [iii]. 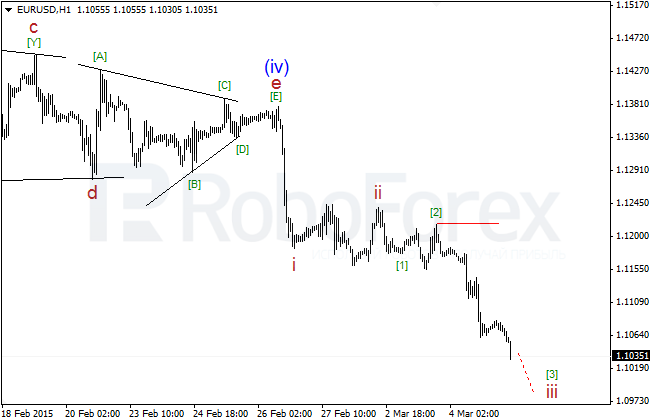 The market has already broken its local low at 1.1097 and in the nearest future is expected to stay below 1.1100. After finishing a correction inside wave ii of (v) in the form of flat, the price has formed the first impulse  of iii and another flat inside wave  of iii. Right now, the pair is forming a large descending impulse  of iii. The market is expected to continue falling. 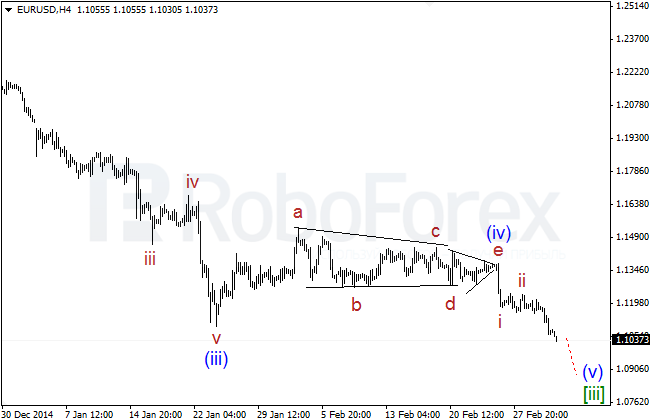 Pound continues falling inside a large descending wave 5 of (1). Right now, the pair is forming wave [iii] of 5 of (1), which is extended. The price is expected to continue moving downwards. After finishing wave [ii] of 5 in the form of expanded flat, the pair has formed the first wave (i) of [iii] and a correction inside wave (ii) of [iii]. Right now, the market is forming a large descending wave (iii) of [iii] inside a larger impulse (5) of (1). The structure of horizontal triangle inside wave (4) of  has been changed a bit. Probably, wave E of (4) of this triangle has taken the same form. 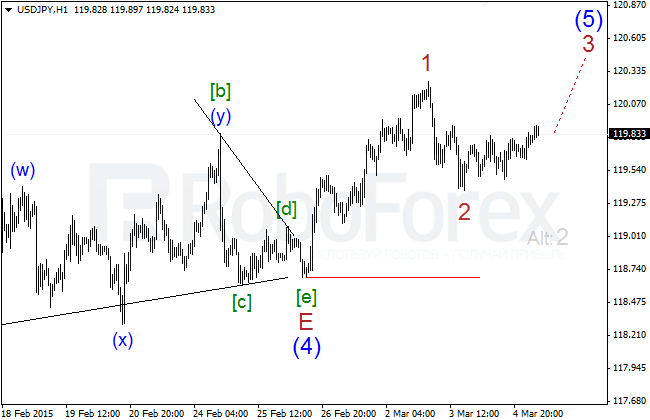 In the nearest future, Yen is expected to form an ascending impulse 3 of (5) of . So, after finishing a large horizontal triangle inside wave (4) of , the price has formed the first impulse 1 of (5) and a correction inside wave 2 of (5). In the nearest future, the pair is expected to continue growing inside wave 3 of (5). 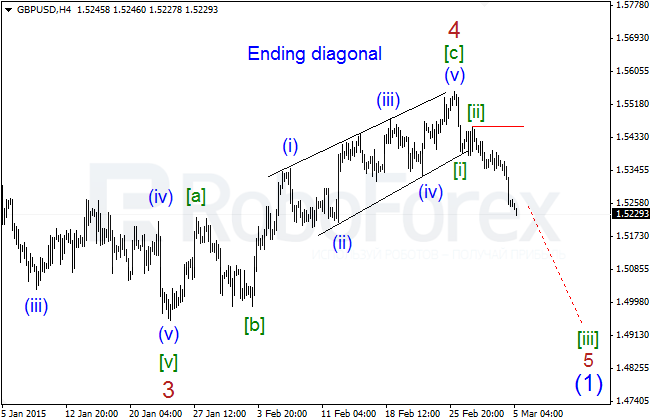 An alternative scenario (colored in gray) implies that wave 2 of (5) may take the form of double zigzag. The market is still moving inside a sideways channel, and it resulted in changing the chart structure a little bit. 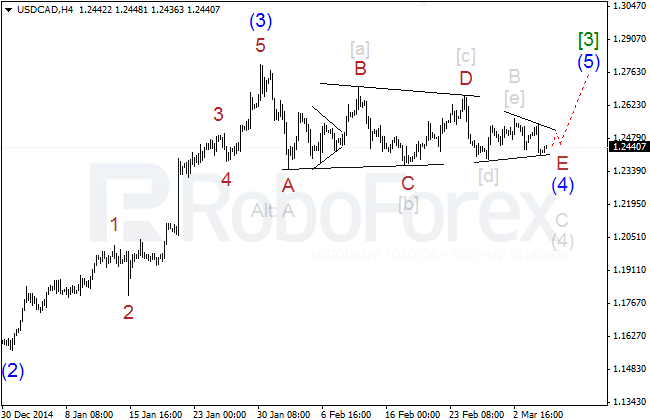 Probably, wave E of (4) is taking the form of horizontal triangle. In the nearest future, the price is expected to complete this pattern and continue growing inside wave (5) of . An alternative scenario (colored in gray) implies that wave (4) of  is taking the form of zigzag with horizontal triangleB of (4) inside it. 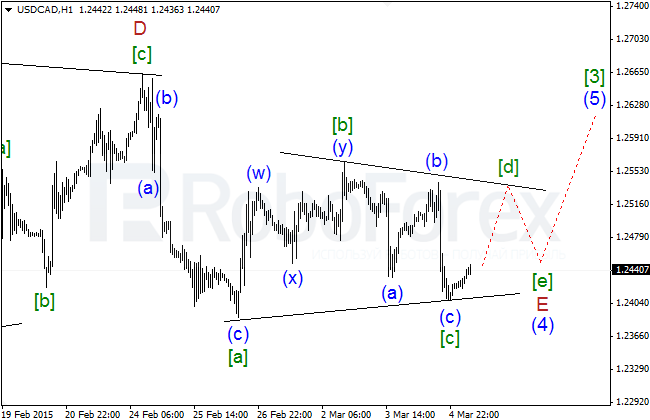 It looks like the pair is still forming horizontal triangle inside wave (4) of . 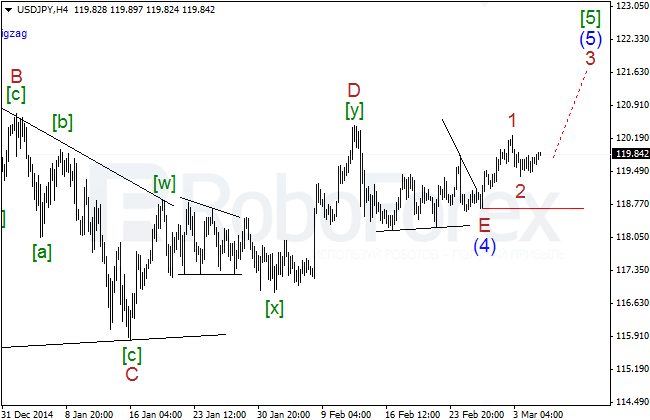 In order to complete the pattern, the market need to form an ascending zigzag[d] of E and a descending one [e] of E.